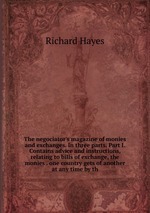 Аннотация к книге "The negociator`s magazine of monies and exchanges. In three parts. Part I. Contains advice and instructions, relating to bills of exchange, the monies . one country gets of another at any time by th"